All photos courtesy of Mission Coffee Co. The team at Mission Coffee Co. has always hung its hat on the idea of craftsmanship, from brewing coffees to building and outfitting much of Mission’s flagship cafe in the Columbus, Ohio, Short North District. 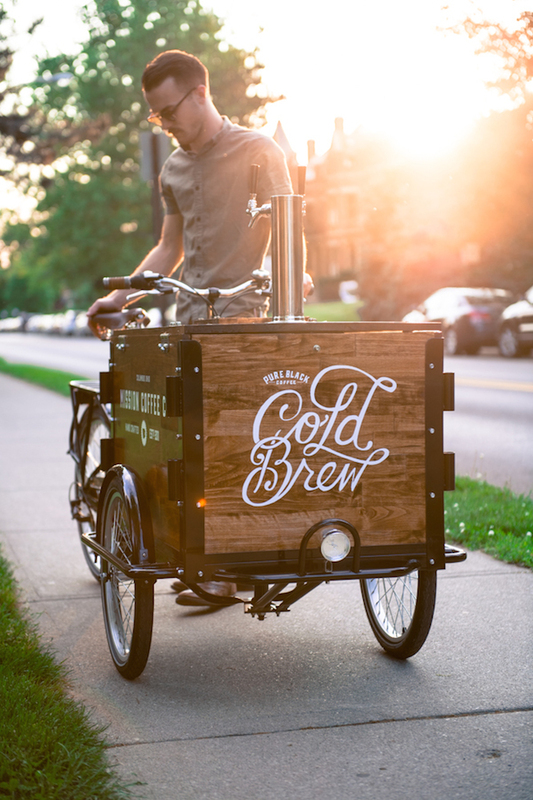 That craftsmanship was put to the test when the company decided to create a mobile cold brew bar on a bike. First off, the Mission Cold Brew bike is just pretty to look at. But it’s also functionally unique, providing cold brew from a nitrogenated keg through two taps, as well as a fold-out pourover bar. 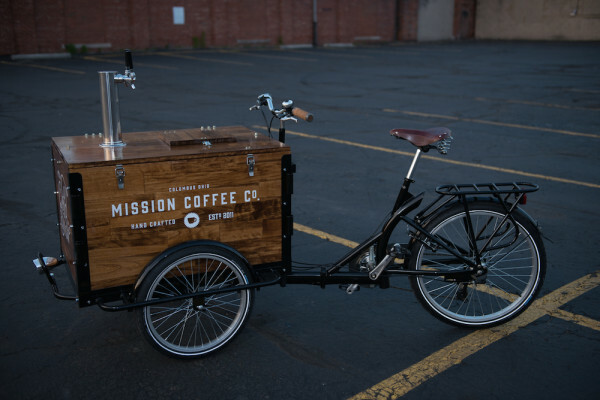 The cold brew bike is only the first of big plans for Mission Coffee Co., which is currently looking into a second retail operation and perhaps launch a roastery. 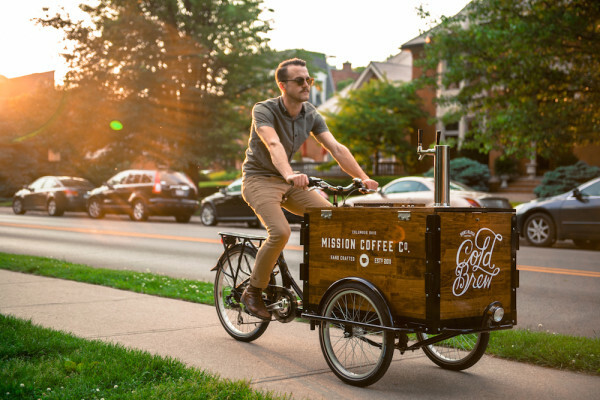 Daily Coffee News recently caught up with Mission’s Nathan Okuley to talk about the bike, future plans for Mission Coffee Co. and the close-knit and growing specialty coffee community in Columbus. Where did the cold brew concept come from, and for how long was it developed before you hit the streets? We’ve been brainstorming big ideas for the coming years, and mobile access to the city was a priority. The city is pretty spread out, and we love being able to hang out in some of our other favorite neighborhoods, so mobile coffee was a must. We started looking at different build-outs and vendors, and spent some time trying to decide what made the most sense. This winter, we found a build-out company in Portland that we really liked, so we started working on sketches and plans. When we received the bike frame, we went to town on it and modified all of the box and storage components to get it on-brand with the rest of our shop. Let’s talk nuts and bolts. How did you put this thing together and what was the aesthetic you hoped to achieve? We were really aiming to match the bike with the aesthetic of our shop, using warm tones and primarily wood and metals for everything. So when we started working on the bike, we aimed for customers to have an experience that paralleled a visit to the shop, from the tap system to the visuals. Building it on our own was also aligned with our roots. When we launched the shop a few years ago, we teamed up with local artisans and made almost everything we’ve got, including the concrete bar made by Jacob Deus — who knew that opening a coffee shop also meant learning how to build tables, weld legs and pour concrete? So, we’re trying to keep consistent with every element of Mission Coffee Co.
You’re on a bike selling cold brew in the summer. How does temperature control work? There are a lot of rules and regulations on serving drinks on a mobile cart or food truck, so we had to make a lot of adjustments along the way. But our box is insulated, with separate sections for the cold brew keg, the nitrogen that pushes out the cold brew, and the cups. We pre-load all of our cups with ice in the shop and surround them with a hefty amount of dry ice. On top, we installed a tap system, much like what you see in our shop on the bar. The newest addition was an add-on side table so we can set up a drip bar for hot coffee as well. How have you been employed the bike thus far? This summer, we’ve been riding the bike to some of our favorite events in the city, from Red, White, and Boom — the biggest fireworks display in the Midwest — to local markets. 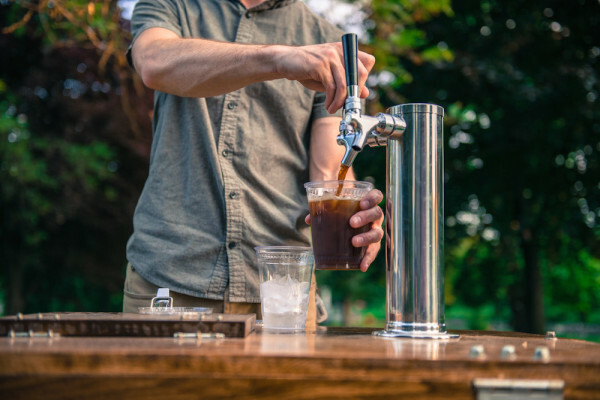 The Columbus business community is very supportive of each other, so we’ve had a lot of fun showing up at breweries or concert venues and supporting their events with cold brew or our pour-over bar expansion. We hope to have a full lineup of events in the coming months, so that locals can know exactly where to find us. Who is currently supplying your coffee, and particularly the cold brew? We love to showcase some of our favorite coffees from all over the country, so we spend a lot of time trying out new coffees, flying around the country, and exploring what is out there so we can bring it back to Columbus. Our customer base has really embraced the chance to try coffees that are roasted as far away as Seattle or San Francisco. We are currently featuring an Amaro Gayo Ethiopia coffee from Deeper Roots in Cincinnati. These guys are doing great work and we’ve had a lot of fun with them over the years. Joe Capatosto is our shop manager and a mad scientist of coffee. He has played with dozens of recipes to find what works. The cold brew that people rave about is entirely his commitment to his fermentation tanks, brewing gear, and many late nights in his lab. Can you tell me more about your plans for a second location and a roasting operation? Ever since we started Mission Coffee Co. we’ve dreamt about roasting our own coffee. A handful of the guys have been roasting on their own for years. We’re working on our second space, which will serve as a cupping lab, coffee education space, roasting and packaging space, and cold-brew production space. The Mission Coffee Co. family is quickly expanding, and we’re really excited to partner up with more local establishments as we begin roasting, hopefully by the end of this year. We’re planning on continuing our current business model of sourcing coffees from around the country, which will keep us active in the national coffee scene as well as help hold ourselves accountable to the level of quality and expertise that we have committed too. What is coffee in Columbus looking like these days? Columbus has had good coffee shops around for years, but the culture has definitely shifted more recently. There are multiple coffee shops in our neighborhood, the Short North, all doing really cool things. But the efforts are very collaborative. We’ve launched the Columbus Coffee Collective and are working with the city on some cool programs to get more people involved. Generally speaking, the market is still being dominated by grab-and-go coffee shops serving frozen, frothy drinks and sugar-based products. Our goal is simply to educate the Columbus community on the things that we love about coffee: the process, the craftsmanship of the product, and the story behind every cup. We’ve been able to teach people a lot, while we have been learning as well, from the price point of a pour-over vs. a K Cup to building an understanding of newer brewing processes and devices that are changing the industry. Mission Coffee Co. exists to create space where people can come and ask questions, explore coffee, and not feel discouraged by any form of pretentiousness or fear. That’s what we love about the Columbus coffee scene. How does the Mission Coffee space fit into the Columbus landscape? We’ve got a beautiful open space located in an entrepreneurship-driven part of town, so on any given day, you will see artists, designers, developers, business owners and musicians meeting together to work on a project. Often times, you can look around and find someone to do just about anything that you might need if you were working on a startup or developing an idea of your own. So that’s a culture that we’ve really enjoyed.